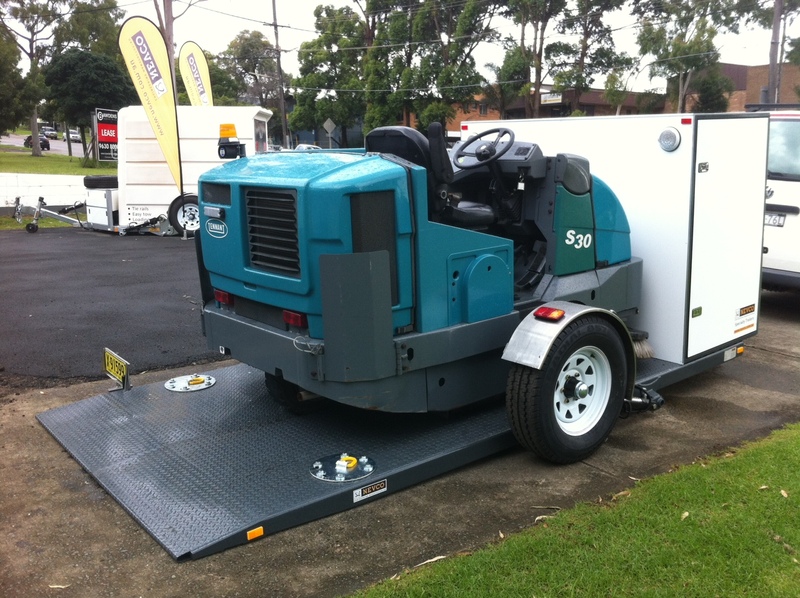 Nevco Engineering is Australian owned and operated and is based in Girraween, Sydney. Nevco was established in 1968 and has been operating continuously for over 44 years. We build to order and the extent of the solutions we can provide is only limited by our combined imagination. We aim to design a solution appropriate to your specific requirement. We are an original equipment manufacturer of hydraulic lifting equipment and systems and the originator of the Nevco EZY APPROACH Trailer. The EZY APPROACH Trailer lowers to the ground making loading and unloading a safe and effortless one-person operation with hand held controls. EZY loading – hydraulic lifting mechanism raises and lowers the deck effortlessly offering as low as 3 DEGREES APPROACH ANGLE. EZY care of vehicle – drive on/drive off with no damage to vehicle. EZY handling – zero turn manoueverability. Single or dual axle (with Lazy Function). 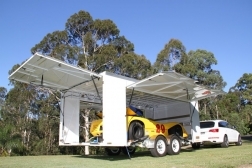 EZY storage – collapsible design means both vehicle and trailer can use the same parking space. Designed for EZY drive on, drive off storage. EZY cargo capacity – customised deck size and choice of cargo capacities – see specifications below. 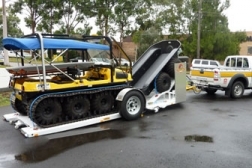 EZY options – electric winch, tyre rack, stone guard, radio remote control, spares package, equipment storage AND partial or full enclosure are available. We matched our CAD skills and our hydraulic experience with our keen interest in designing and producing a unique ground loading trailer solution to fill a gap in the market. 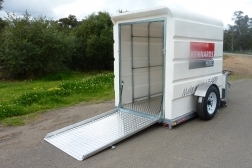 Each EZY APPROACH Trailer is custom designed and engineered to exceed Australian Design Rules (ADR), Australian Standards and state/territory registration requirements. 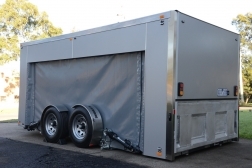 All our trailers are manufactured on site and every trailer is built to order to suit individual requirements. We build to order and the extent of the solutions we can provide is only limited by our combined imagination. We aim to design a solution appropriate to your specific requirement. 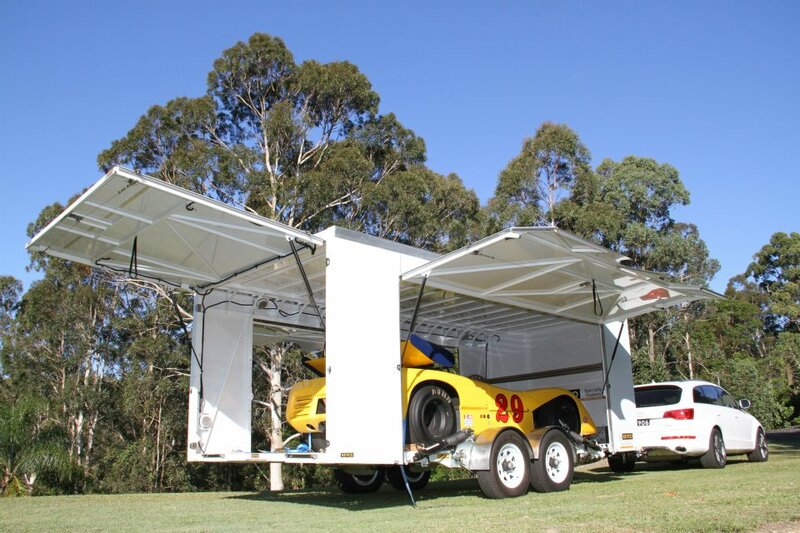 CARGO CAPACITY is calculated by subtracting the mass of the finished trailer (with options) from the ATM rating. The finished mass of the trailer is driven by the size (length) of the deck and the options included. We use the HIGHEST QUALITY new components. The wheels, tyres, hubs and bearings are specially selected for the task with load ratings exceeding the requirement. We only use high tensile mild steel for structural components in our chassis – we source our steel from large steel merchants who can verify the origin of materials. We DO NOT use cheap imported steel. 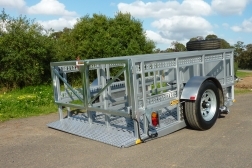 SINGLE or DUAL AXLE Trailer?? Our high capacity single axle sets allow an ATM of up to 3200kg. The running gear is carefully selected to match. Our approach is to only add axles as the cargo capacity requires although an additional benefit with a dual axle format is that a longer cargo deck is possible without having excessive rear overhang – exit and approach angles as well as rear swing when turning. 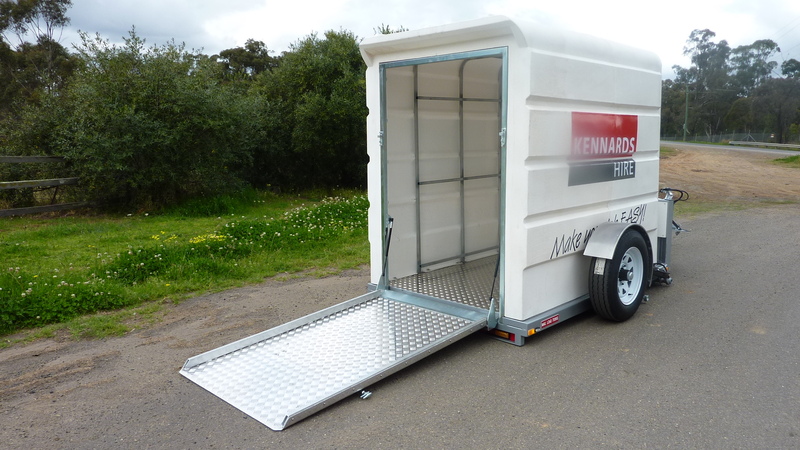 When the cargo deck length exceeds 5300mm we suggest considering a dual axle format. The cargo deck length is determined by the best balance point accommodation of the vehicle(s) and/or equipment to be transported. 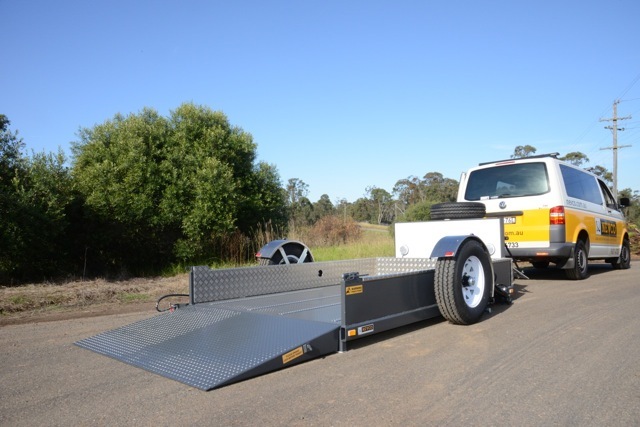 We work from information including axle weights, wheelbase and front and rear overhang measurements to determine the ideal deck length and optimum positioning of the trailer axles. We are able to design a layout with the diversity to carry equipment with varied weight distribution (either front or rear engine vehicles and a range of equipment or static cargo). The table below offers preliminary information in relation to the model range. Due the the highly customised “build to order” nature of the EZY APPROACH we express our pricing as “from” a “base” which refers to a chassis ATM capacity. We have developed a vast array of options specific to many and varied applications. 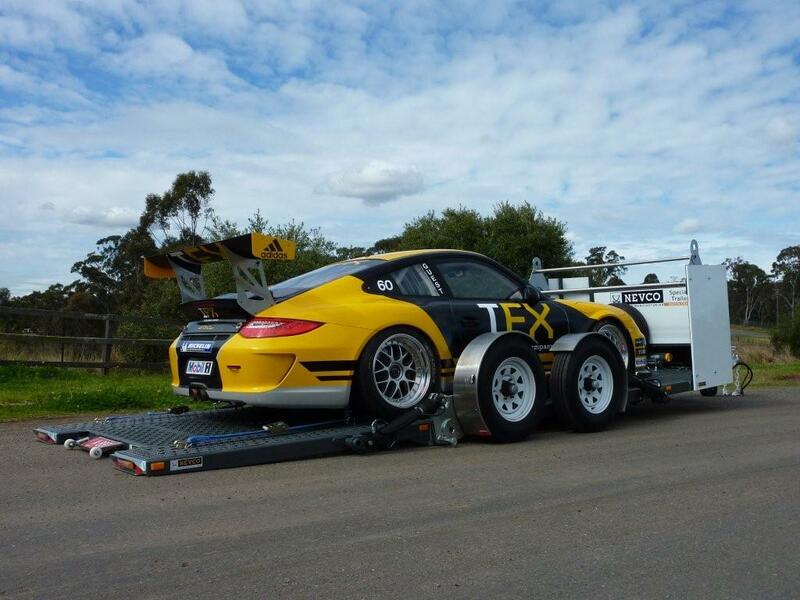 CONTACT US via our website OR speak directly with one of our EZY APPROACH Specialists on 02 9631 4733 (or +61 2 9631 4733 if calling internationally) to determine which chassis and options COMBINE to best suit your purpose. 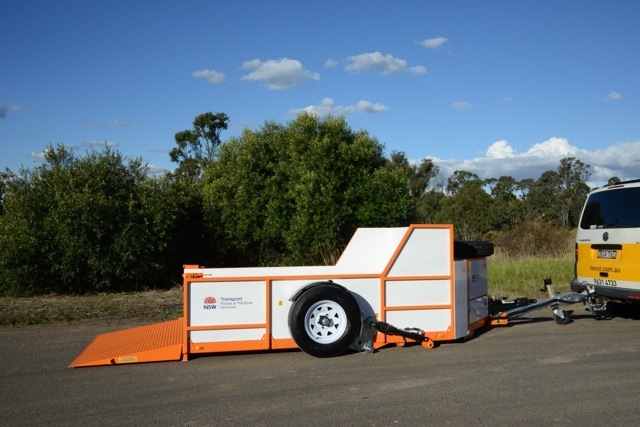 For more information CLICK on the side bar under the heading SPECIALTY TRAILERS for the trailer application that suits your requirements THEN contact one of our EZY APPROACH Specialists. 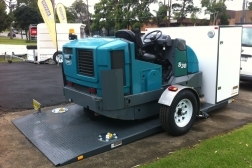 * All pricing is ex Nevco works, excludes on-road costs and excludes GST. 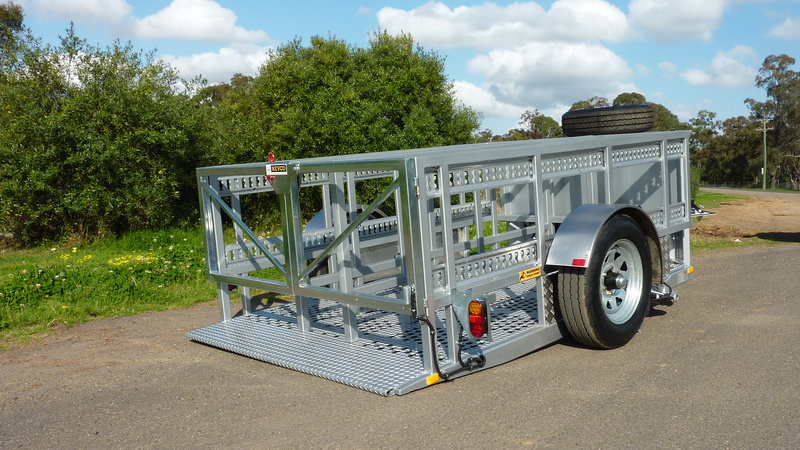 All trailers are custom built to order. ** For customers outside Australia please contact us for local landing pricing.